Nowadays Japanese people are coming up with a lot of new, unique and weird ideas. 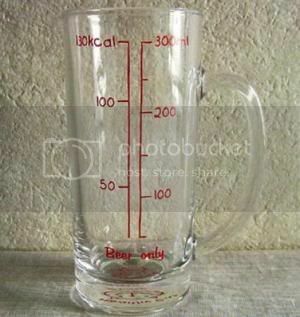 Here’s another one, it’s a beer mug which has a meter which lets you know how many calories you are consuming while you drink a glass of beer. It says 300ml is equal to 150cal, well I don’t know how far this is true. Anyways who cares most of the people who drink beer aren’t really concerned about calories consumed. I think it would be cool if there was a drunkometer which controls you from getting over drunk, atleast some people who don’t have control over drinking would like it.